Auguste Delaherche (1857-1940) was born in Beauvais and trained at the École des Arts Décoratifs. He worked as a restorer of stained glass, a designer of religious jewellery and as director of the electroplating department at the Christofle company in Paris. After this very mixed experience, he made his first pots in salt glazed stoneware inspired by folk traditions at L'Italienne pottery, Goincourt. In 1887 he bought the workshop of Ernest Chaplet in rue Blomet, Paris and became a full time potter. He was awarded a gold medal at the international exhibition, Paris, 1889 and his wares, made in multiples, were very much in demand thereafter. In 1894 he left Paris for Armentières near Beauvais to work quietly in the country. By 1904, like many of his contemporaries, he began working in porcelain as well as in stoneware, and dispensing with assistants, he concentrated solely on unique wares. His early pots were inspired by folk pottery and the decoration on this dish retains some of the simple floral patterning associated with traditional wares. From 1887 Delaherche's experiments with high temperature glazes and different firing techniques provided him with a sophisticated range of colours and surface effects. 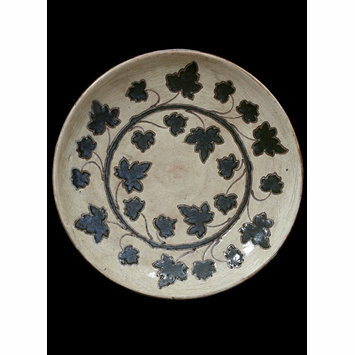 Dish of stoneware decorated with an incised wreath of ivy leaves in green on white slip. Bought from Auguste Delaherche. Possibly exhibited by him at the 1889 Paris Exposition Universelle. 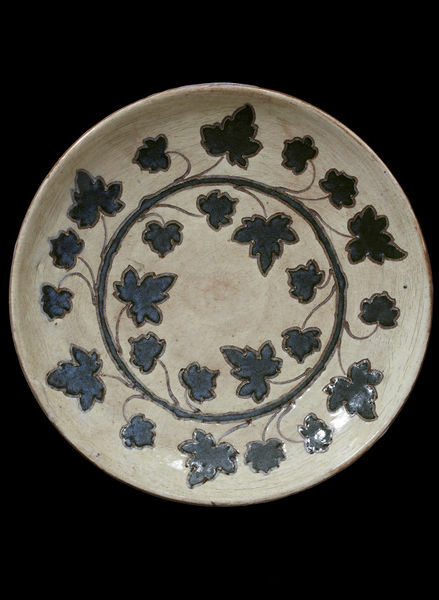 Dish of stoneware, made by Auguste Delaherche, Paris, ca. 1889.